One of my favorite presentations at the Boston Hockey Summit in May was Jim Snider’s talk on “Dryland Speed Training for Hockey”. 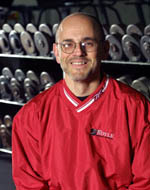 Coach Snider is the Strength and Conditioning Coach for the Men’s and Women’s Ice Hockey teams at the University of Wisconsin. Needless to say, that program has an outstanding reputation. 1) He was a big advocate of uphill sprinting. Why uphill? Sprinting uphill increases the foot/ground contact time, which is more specific to all forms of hockey skating (forward, backward, crossovers, and direction changes). Adding an incline to sprints also minimizes the risk of blowing out a hamstring and cuts down on the landing forces that need to be absorbed by the legs and hips (takes stress of your ankles, knees, hips, and low back) since your leg isn’t “falling” from as high as it would during flat ground or downhill sprinting. I think people can get carried away with hill training. The goal isn’t to find the biggest hill in your community and run your athletes up it until they puke. If the incline is too steep it will start to have a negative effect on running form and can put unnecessary stress on your athletes’ achilles tendon. Try to find a hill that is around a 10 degree incline and use that. Starting a sprint from a lunge position is a brilliant way to teach people to drive hard from a stationary position and maintain the forward lean they need to accelerate. I’ll try to get pictures/videos of these up in the next few weeks so you can see exactly what these movements look like.